Snowy brings your clients and community together. Beautifully designed bug tracking that makes powerful features easy to use. You'll be more efficient with painless GitHub and jsFiddle integration. Snowy is smart enough to handle the details of managing and finding issues. Use our API to track all errors from your applications. If Snowy fails you, we're here to help you, for any reason. Create unlimited public projects for free. Pay only for private projects. Choose a plan after signup - upgrade or downgrade at anytime. Not only do we sport a clean, well-laid out interface, but it's extremely pleasing to look at. 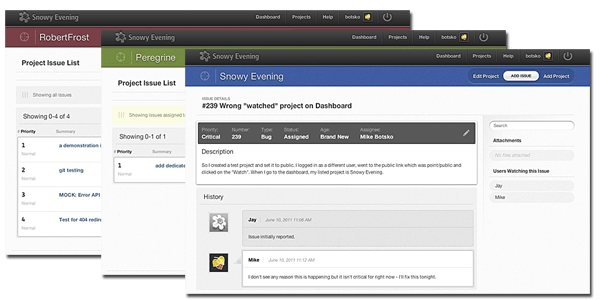 We understand how much time your team spends looking at your issue tracker but now with Snowy, your clients/users won't be afraid to. We're constantly working to make sure Snowy looks just as wonderful on any device as well. Your overview gives a summary of every open project you're involved with, and every statistic is a link to a pre-made filter. Project navigation is so simple, you can jump between projects with the fewest clicks possible, no matter where in the application you are. You'll be adding a lot of issues, so we've made it impossibly easy. Only an issue summary is required - every other field is set to sensible defaults. When needed, you can add a full description (with Markdown support), set versions, milestones, priorities, (and more), and even upload multiple files. Everyone needs to see a different issue list. Filter your issue lists with our incredibly simple form and even save your filter for future use. Easily jump between filters using links on the sidebar. Or use our default filters for the most common list views. Need to find an issue faster? Our search is smarter than most and is a lot more flexible with variations on words. Open issues are given priority over resolved/closed to help you find those urgent issues. Know the bug number already? Type it into the search to go directly to it. From the moment an issue is reported, you can see it's entire history in chronological order. Issue timelines show every change a user makes, every comment, file upload, and (when using GitHub integration) commits. Snowy saves you time when adding comments by automatically turning pasted web addresses into links, automatically adding comments to original issues when you close a duplicate. If you mention another issue Snowy will automatically convert it to a link, and will even update the other issue with a notice that it was mentioned. With a few straightforward steps you can connect a GitHub or BitBucket repository to a Snowy project. When you mention a bug number your commit message and a link to the repository commit page will automatically appear in the issue history. You can even resolve the bug through your commit message using ":resolved" after the issue/bug number. Github Gists are a great way to share code snippets. Simply copy your Gist web address and paste it into issue description or comments and Snowy will automatically embed the Gists for you. No matter the language or type of application, you can send error reports with traces back to Snowy with our simple JSON API. Snowy includes duplicates in a single issue which you can track like any other issue. Finally, you'll have some helpful information when customers tell you something broke. Available for Starter and higher accounts. Organizations allow you to group projects and users together. For example, you might create a company organization that your coworkers and clients can access, and keep your personal organization for your own projects. Use only your snowy account, and switch between your different organizations. Tag issues for easier categorization. Our Smart Filter will allow you to filter issues by any choice of tags. Tags created are per-project, so you won't see unassociated tags from other projects or users. We've begun work on a brand new API. Today, a much improved remote error logging API is live and available to use. We decided to completely redesign the API so that we'd have a solid, high-performance foundation for a full API (projects, issues, etc), which is in progress. Your API keys are per-organization and also work for our sister site, pste.me. Bulk editing — Apply basic changes to multiple issues directly from the issue lists. Milestones with due dates — Define target dates for milestones, Snowy wil automatically create a smart filter for you. Invite via email — Add collaborators by entering their email if they don't have a Snowy account yet. We'll auto-link them to your project on signup. Custom Status — Small Business and higher plans can customize issue status options. Read-only milestones — Completed a milestone? Set it to read-only and users will no longer be able to choose it on new issues. We're not ready to make our import tools live, but if you send us export data from your current bug tracking application we will import it all for you, for free. XML data preferred, but csv and JSON data accepted. Who the heck are we and why does the world need Snowy Evening? I'm Mike Botsko and I've been in web development for fifteen years. I've used tools like Bugzilla, Mantis, Jira, Lighthouse, Sifter, and Pivotal Tracker and while they each impressed me with some ideas, I've had too many complaints about them all. It was even harder getting coworkers and clients to use them. Most were designed by developers, and clients ran away screaming. In 2009 I set out to build a better tool and here it is - Snowy Evening. It's solved every problem I had with an amazing interface (thanks to PointCreative, Inc.), GitHub integration, remote error reporting for our deployed applications and most importantly, it's so well designed that our clients enjoy using it. During development and our beta periods we had dozens of teams enjoying Snowy. We're so invested in this project that we're here to see it grow with a real launch. So give Snowy a try, and let us know if you have any issues. Let's grow together.